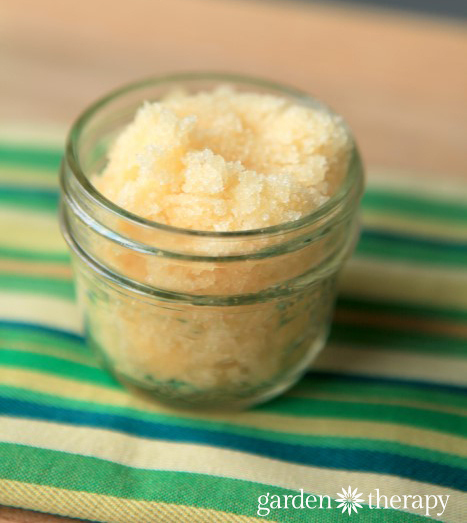 Slough off dry, dead skin with this moisturizing homemade sugar scrub. The lemongrass and ginger scent combination makes for an invigorating aroma that wakes up the mind, while the essential oils work to stimulate muscles and promote circulation, better joint function, and pain relief. 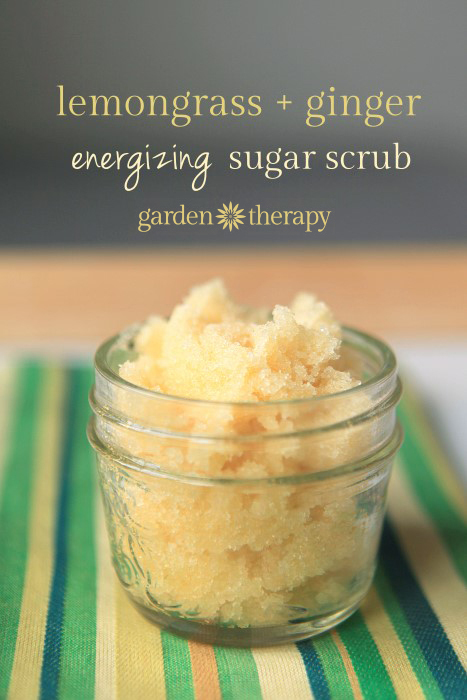 Kick start your day with this energizing, healing scrub. Lemongrass essential oil stimulates circulation as well as healthy joint and tendon function so it’s an invigorating and healing choice for a skin scrub. Its aroma will wake you up but also keep bugs from biting, making it perfect for mosquito season. Lemongrass and ginger oils are great for stimulating digestion, so it can help if you are having tummy trouble as well. With all those great benefits and a yummy aroma, what’s not to love!? If you are interested in adding lemongrass to your herb garden, learn more about growing lemongrass and using it in recipes here. Ginger essential oil can help relieve muscle tension, backaches, and arthritis pain. This spicy essential oil has some heat to it, which will create a warm tingling sensation. I love the way this feels, but some people don’t like it, so if it’s not for you be sure to try one of my other sugar scrub recipes. Both lemongrass and ginger may cause skin irritation in some people, but with 4 drops to 3/4 cup of carrier oil, it is quite diluted. Even my sensitive skin is completely fine with this scrub. It’s best to try a bit on a small area of skin before you go all out with it though! Be sure to also check out my recipe for rosemary and spearmint sugar scrub for a different energizing scent combination. In a bowl or large 1 L measuring cup mix together the sugar, oil, essential oils, and turmeric. Spoon mixture into small jam jars and smooth out top. Optional: download and print these freebie canning labels to dress them up!